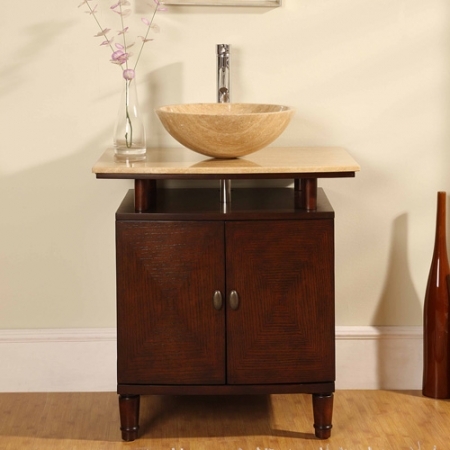 The cut of this hardwood cabinet is undeniably modern, especially when coupled with the Travertine vessel sink. Two doors open to reveal an shelf storage space. If room in the cabinet runs low, you could stash a few items in baskets in the open area under the sink, although leaving it open provides a clean, contemporary look. Additional Sizes: Also available in 29 Inch Single Sink Bath Vanity, 46 Inch Single Sink Bath Vanity, 73 Inch Double Sink Bath Vanity. Counter Top: Travertine is a form of limestone deposited by mineral springs. Travertine is a porous stone that in raw form has lots of veining and pits. When Travertine is used for countertops, it is honed, which means the pits are filled and sanded to create a smooth surface. The Travertine countertop on this vanity has a matte finish. It may look dull upon inspection, but that is due to the type of Travertine. You can apply a glossy sealer to it if you prefer a gloss finish. Travertine can be damaged by acidic foods and cleaners, and is more vulnerable to scratches and etching (water marks) if not dried routinely. It is recommended that you seal Travertine at least every 3-6 months. 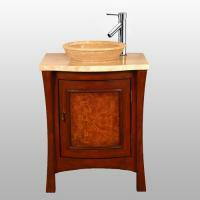 We are a remodeling firm and shop for a number of bath and kitchen items on-line. UV made the process seamless. We were also impressed with the packing and condition of the piece. The vanity itself is very attractive and a good value. 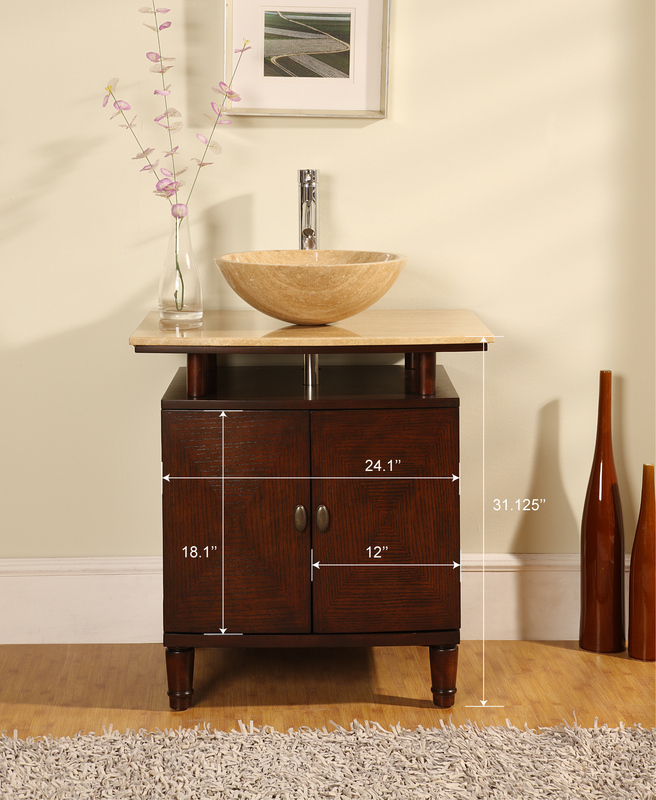 We will be specifying and shopping more from Unique Vanities. Thank you. You made us very happy. 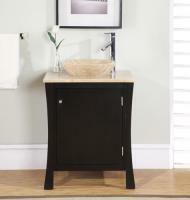 The vanity and vessel sink certainly add a touch of class to our upstairs bathroom. Great website, easy to navigate. Great service, we will recommend! Your service hav been awesome. Q: If I purchase the cabinet only, is the hole pre-drilled for the vessel sink? A: Yes. The counter top is pre-drilled for the vessel sink and for a single hole faucet. Q: What is the diameter of the drain hole? A: The diameter of the drain hole is 1.5". Q: Is the 37îH including the sink? 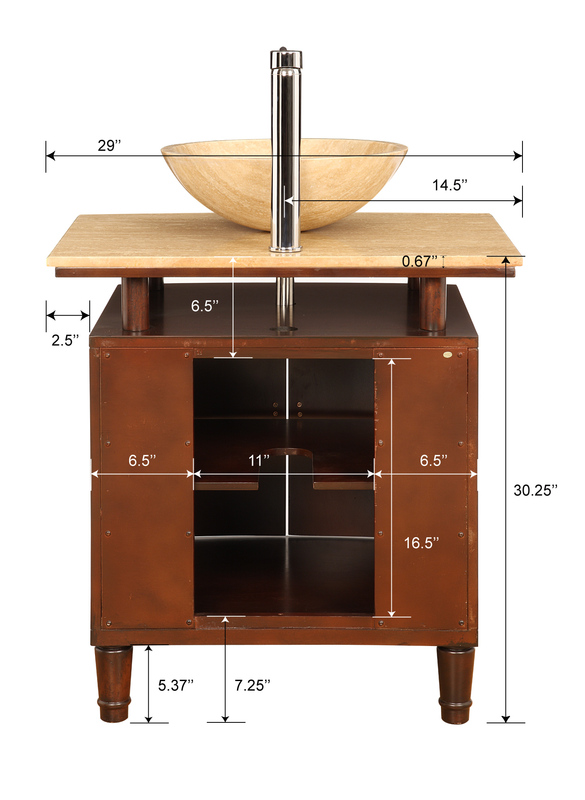 A: Yes, the height of the sink is 6î so that would make the cabinet itself 31îH.